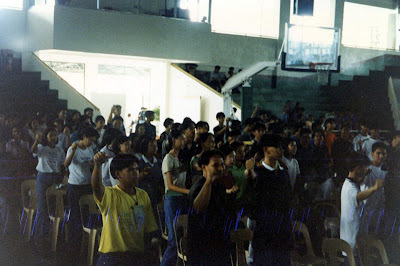 I was the one who brought the tradition to Lipa of beating the air with the fist during the singing of the alma mater song. No, I did not invent the tradition; and, yes, I do not even know how it originated or what it is supposed to mean. 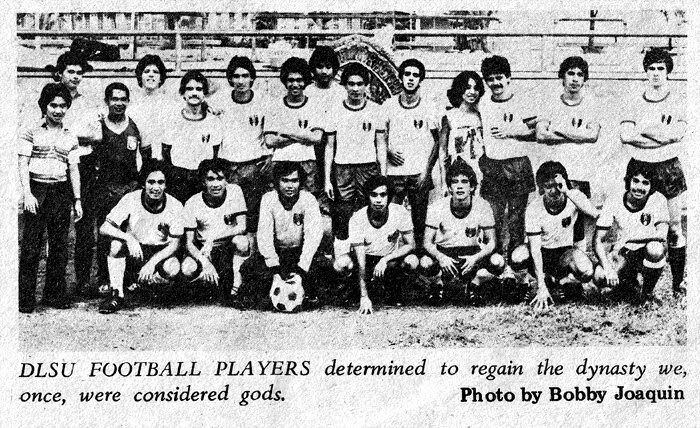 For most of the eighties, I think I was the only one among the members of the faculty who went to college in Taft. Most everyone knows that I played varsity football in college. 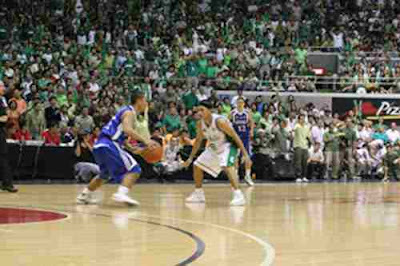 What not a lot of people know is that I used to be a regular in NCAA basketball games as well. It was in these NCAA games that I quickly learned that all the competing schools sang their alma mater songs at the end of each game, win or lose. I think it was more or less accepted that the winning school sang first; although I don’t think that this was really a rule of thumb. Sometimes, it was just down to how quick the brass band – which every school brought to its NCAA games – was to get started. What I did not know, but learned soon enough, was that all students who watched NCAA games instinctively raised their fists and beat the air with these while their alma mater songs were being sung. Yes, everyone; not just La Salle students. Initially, I thought this was done only during NCAA games. The raised fist, after all, is a universal symbol for rallying for battle. 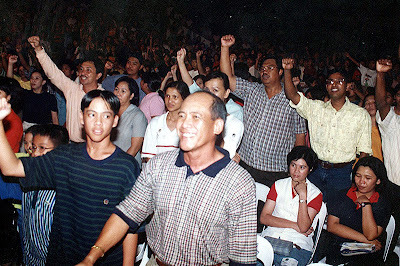 I learned soon enough, though, from my teammates who went to high school in Greenhills that they raised their fists as well during graduation. In Taft, during pep rallies – which I only started attending when I became a varsity player in my junior year – everyone did the same. Not only pep rallies; but every occasion when the alma mater was sung. 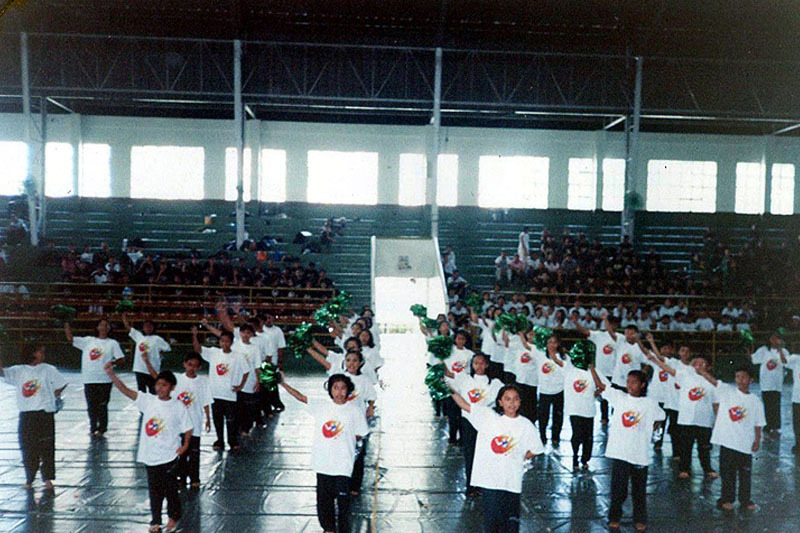 When I returned to Lipa to teach, well, I knew from my student days that the tradition was not known here. 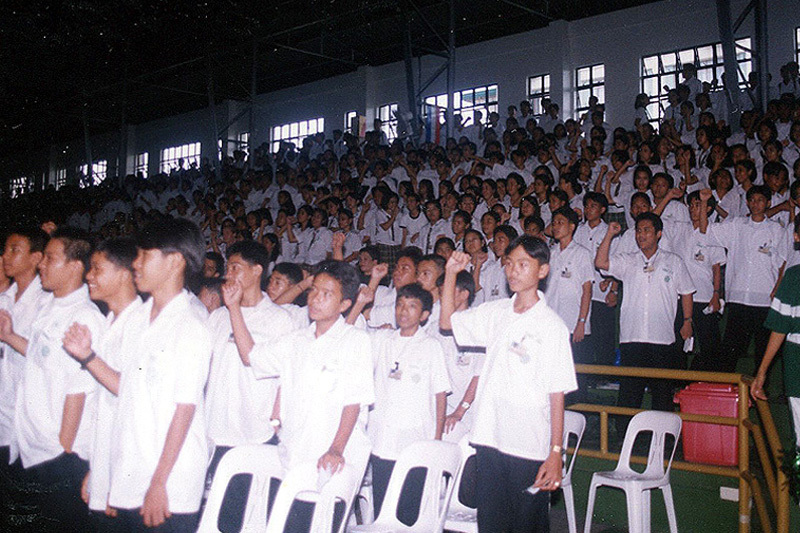 The first time that I attended an event when the alma mater was to be sung, I instinctively raised my right fist, quickly realized that nobody else was doing the same and then sheepishly brought my arm down. All the while feeling extremely foolish, if I may add. I finally got my chance to introduce the tradition when I was a Homeroom Adviser during Schoolyear 1985-86. 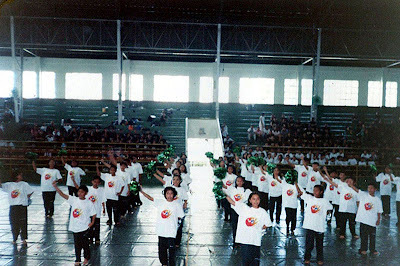 In the Cheering Competition, of all things, during the performance of my class which I was determined to choreograph. Everyone’s idea of the competition, of course, involved pompoms, dancing and forming strange little formations on the floor of the gym. I was having none of that. I chose several males to act as cheerleaders while the rest of the class sat on the wooden bleachers of the gym. 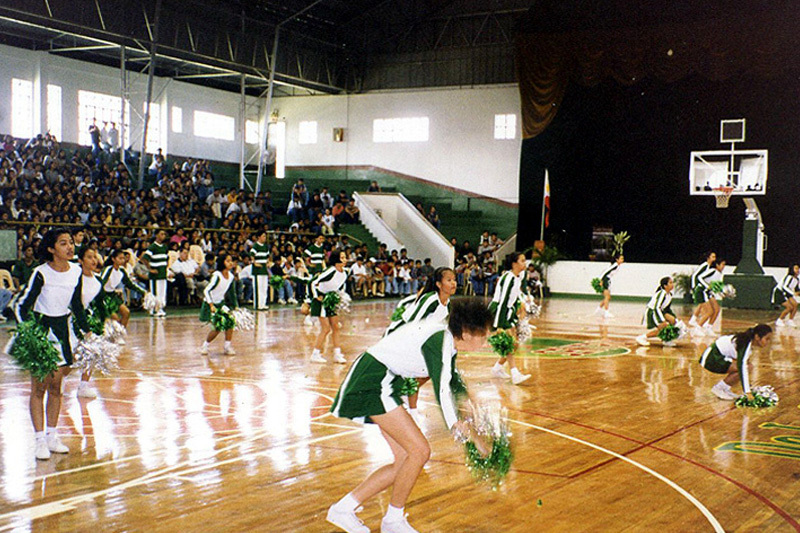 It was exactly as the cheerleaders used to do at halftime during the NCAA games that I used to watch; and which is still being done in the present both in the NCAA and the UAAP. We won the competition; but I think it was more for being different than anything. I do not think that anyone had seen anything like that at all during a cheering competition. To get back to the story, as choreographed, everyone in the bleachers stood up for the concluding alma mater song, and from where I stood, my students were a right pretty sight with their fists beating in synchronicity. 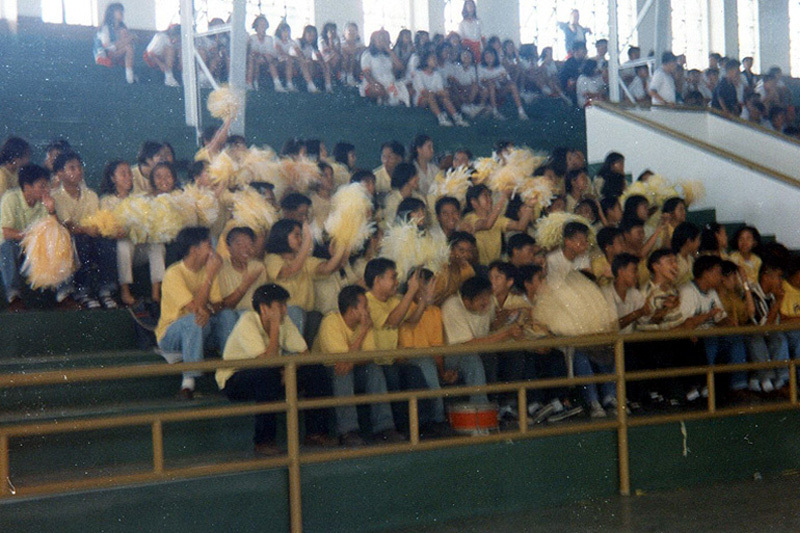 Those from succeeding batches may also well recognize what later became known as “bench cheering.” I and the students in my homeroom introduced this as well. I will be the first to say that there was no originality to the idea whatsoever. We simply simulated what I used to experience when I was in college. I don’t recall that the idea of beating the air with the fist caught on immediately. 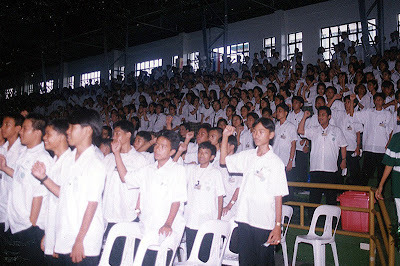 If I am not mistaken, it finally did when I was emceeing the graduation ceremonies and I made the students of one batch raise their fists for the alma mater song. Now, which batch that was, somebody please say using the comments box at the bottom of this page. I just do not have the foggiest. To get back to the alma mater song itself, and this is nothing more than to document a bit of trivia, there were slight differences to the way the song was sung in Taft and the way we used to sing it when I was in high school in Lipa. 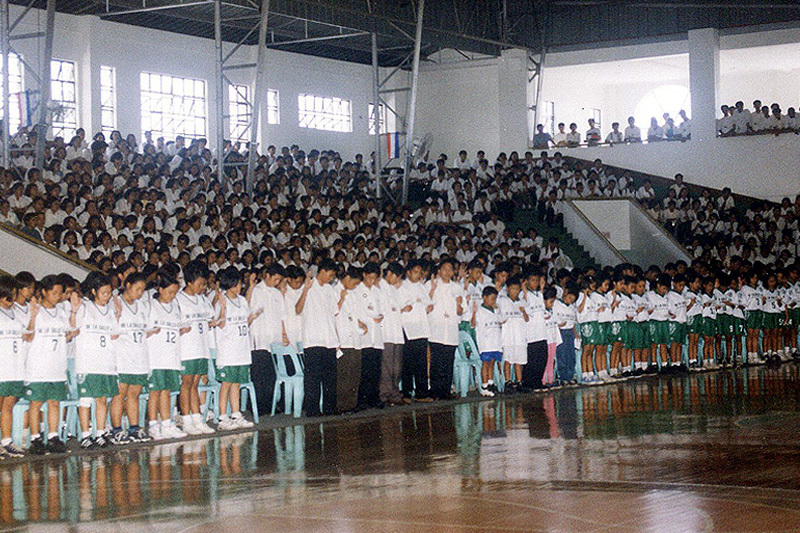 These days, everyone just sings “Hail to De La Salle!” I think I might unwittingly have caused the change even before One La Salle standardized the anthem throughout the archipelago. In Taft, I just sort of lost the Lipa version and when I started publishing the graduation souvenir programs for Lipa, I just simply used the Taft version unthinkingly. Ditto when I was leading the alma mater song during graduation practices. It was always funny whenever I attended the alumni homecoming and the old guard stuck to the old version. But everyone caught on soon enough. The funny thing is that in the many events for Lasallian educators and students that I attended over the years, it was not unusual to hear somebody from another school use “shield” instead of “cheer.” Now, how the devil did that happen? And which is the correct version? And how can one song be so confusing? At any rate, just to conclude, what I find most regrettable is that people have stopped singing the Victory Song. 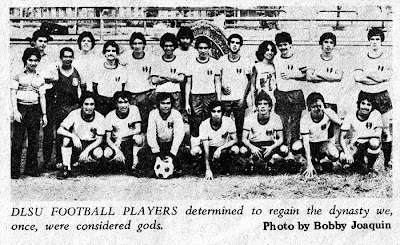 I don’t think they still sing it in Taft, either.